Invisalign® is a virtually invisible orthodontic treatment used to improve the appearance of your smile by correcting the alignment of your teeth and the way you bite together. Unlike traditional fixed braces which are cemented to your teeth for the duration of your orthodontic treatment. Invisalign® is clear, removable and comfortable which no one will know you're wearing. 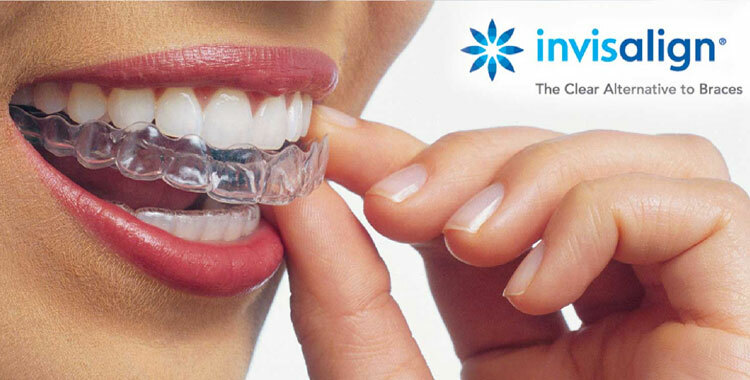 Invisalign® uses the latest in computerised technology and three-dimensional modelling to generate a series of clear, see-through trays “aligners” which fit closely over your teeth and are virtually unnoticeable. The clear aligners are specially fabricated to fit your teeth exactly and work by moving your teeth gradually week by week, millimetre by millimetre into a position that gives you a natural-looking, beautiful smile. Worn for 22 hours a day. Removed when you eat, brush and floss. Changed approximately every two weeks as your teeth slowly move. You will have regular progress checks with your dentist or orthodontist. Your Invisalign® treatment will start with a dental examination by an experienced Invisalign® dentist. He will examine your teeth to see if Invisalign® is suitable for you, if so, an impression (mould) of your teeth will be taken using special dental "putty". The impression will then be sent to Invisalign® for processing. Photographs and x-rays will be also taken of your teeth and smile from different angles. At the Invisalign® laboratory, using the latest computer imaging, a three dimensional model is created. The model is used as a basis to generate a simulation of your teeth movement from their current position to the final desired position. Your dentist will then discuss the treatment plan with you. Invisalign® will use the computer simulation to fabricate a series of custom made aligners to fit your teeth exactly. Each aligner is slightly different, moving your teeth gradually into the desired position. You will wear the aligner day and night, only taking then out to eat, brush and floss, for approximately two weeks, before moving on to the next aligner in the series. Your dentist will need to see you every four to six weeks for a progress review; you will also receive the next aligners in the series at these appointments. This process will continue throughout your treatment until your teeth are in the desired position. You will be given strict instructions on how to use and look after the aligners. They must be worn for a minimum of 22 hours a day. The success of the treatment highly depends on your compliance as a patient and requires dedication.